Citation Information: J Clin Invest. 2006;116(10):2748-2756. https://doi.org/10.1172/JCI24274. Mast cells are involved in many disorders where the triggering mechanism that leads to degranulation and/or cytokine secretion has not been defined. Several chronic inflammatory diseases are associated with increased mast cell numbers and upregulation of the TNF receptor family member CD30, but the role of elevated CD30 expression is poorly understood. Here we report what we believe to be a novel way to activate mast cells with CD30 that leads to degranulation-independent secretion of chemokines. CD30 induced a de novo synthesis and secretion of the chemokines IL-8, macrophage inflammatory protein-1α (MIP-1α), and MIP-1β, a process involving the MAPK/ERK pathway. Mast cells were found to be the predominant CD30 ligand–positive (CD30L-positive) cell in the chronic inflammatory skin diseases psoriasis and atopic dermatitis, and both CD30 and CD30L expression were upregulated in lesional skin in these conditions. Furthermore, the number of IL-8–positive mast cells was elevated both in psoriatic and atopic dermatitis lesional skin as well as in ex vivo CD30-treated healthy skin organ cultures. In summary, characterization of CD30 activation of mast cells has uncovered an IgE-independent pathway that is of importance in understanding the entirety of the role of mast cells in diseases associated with mast cells and CD30 expression. These diseases include Hodgkin lymphoma, atopic dermatitis, and psoriasis. Treatment of CBMCs with CD30-Fc does not lead to degranulation or synthesis of lipid-derived mediators. 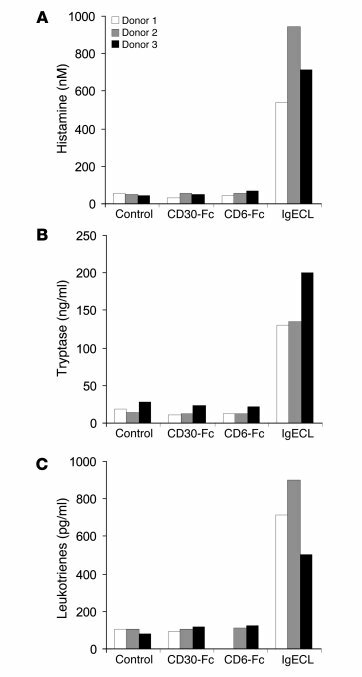 In vitro CBMCs (1 × 105 cells/ml) from 3 different donors were stimulated for 30 minutes with CD30-Fc (10 μg/ml), CD6-Fc (10 μg/ml), or IgE cross-linking (IgECL). Culture medium was recovered by centrifugation and analyzed for the presence of (A) histamine, (B) tryptase, or (C) leukotrienes.